Welcome to Pricescope's 4Cs Diamond Guides. Learn everything you need to know about buying a diamond-starting with the basics. The 4Cs are factors that determine a diamond's quality and price. The Guides will give you the information you need to make an educated purchase online or at your local jeweler. Have questions while you learn? Register for our diamond and jewelry forums and get help from knowledgeable consumers and experienced diamond trade members. Carat Weight is the simplest and only truly objective factor of the 4C's. Diamond carat weight is also the biggest influence on price. Cut refers to the proportions and relative angles of a faceted diamond. Cut is a quality factor that determines value along with the other 4Cs. Clarity refers to the existence of internal and external imperfections that characterize an individual diamond. Diamond color refers to how little color is present within a diamond. Learn more about diamond color and value. What diamond should you get? This guide will help you prioritize the 4Cs. Looking for a ring? Enjoy this selection of popular diamond settings. Why do you need a diamond appraiser? Independent 3rd party report to help you verify your diamond purchase. What is Hearts and Arrow? What is Diamond Table size? The girdle is the edge of the diamond and is quoted in either words (Thin, Thick etc) or as a percentage of the diameter (e.g. thin = .6% or thick = 3.0%). Modern round brilliant cut diamonds are composed of flat polished surfaces called facets. These facets are arranged in a specific pattern to receive light and to return light to a viewer’s eye. The point on the bottom of a diamond's pavilion is called a culet (pronounced que-let or the French sounding que-lay). Most labs grade Symmetry as Excellent, Very Good, Good, Fair or Poor on a GIA report. Polish is graded the same way as symmetry: Excellent, Very Good, Good, Fair or Poor on a GIA report. AGS add their ‘Ideal’ Polish to the above list. The HCA estimates a round diamond's appeal based on light return, fire, scintillation and spread. Brilliance is an essential attribute of a beautiful diamond and has 2 components; brightness and contrast. 40 years ago grading reports were only done for the finest quality diamonds. But today even very low quality larger diamonds sold in Wal-Mart come with a cert. 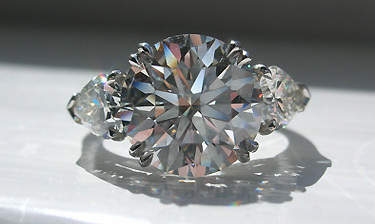 Glare is light reflected off the diamonds surface. A fish-eye is a nasty appearance that you can see just inside the table of a diamond. Spread is very important to you, but hardly ever talked about by technicians working away in labs. In 1919 a young mathematician, Marcel Tolkowsky, wrote a Masters thesis on the proportions for round brilliant cut diamonds. This became the basis for what is now known as the “Ideal Cut". What is an AGS Ideal Diamond? Firescope is based on Mr. Okuda from Japan's 1970's invention. The Sarin digital scanner measures diamond proportions 10 times faster and more accurately than previous method. Imitations diamonds and faked improvements to natural stones date back thousands of years. Jewels and gems last a long time, so good sales people will make claims like this is an "investments" and "will always be worth more than what they cost". Diamond quality refers to a combination of factors known as the 4Cs. Diamonds are graded by diamond laboratories, and then ultimately rated and priced accordingly.